Stake out your campsite, pitch a tent and let your fun-filled weekend begin! Exclusive shows, fun challenges to win tickets, easy access to the festival stages - camping is the most fun way to experience the Festival! The Festival Campground in Telluride Town Park is only steps away from the Main Stage and Main Street. Stake out your campsite, pitch a tent and let the fun-filled weekend begin! There are four ways to camp: Standard Camping, Glamping and Basecamp Gear Rentals. All Camping Passes are on sale now. Click here for more info. Warner Field - the baseball field on the right as you enter the park. No trees. Town Park Campground - the large, wooded general area of the campground. Zone One - the wooded area behind the campground, no vehicles. Camping is communal in all areas, there are no designated campsites. You are welcome to put your tent up wherever you want. The campground is more of a social than a wilderness experience, it gets a bit crowded so be prepared to be close to your neighbors! 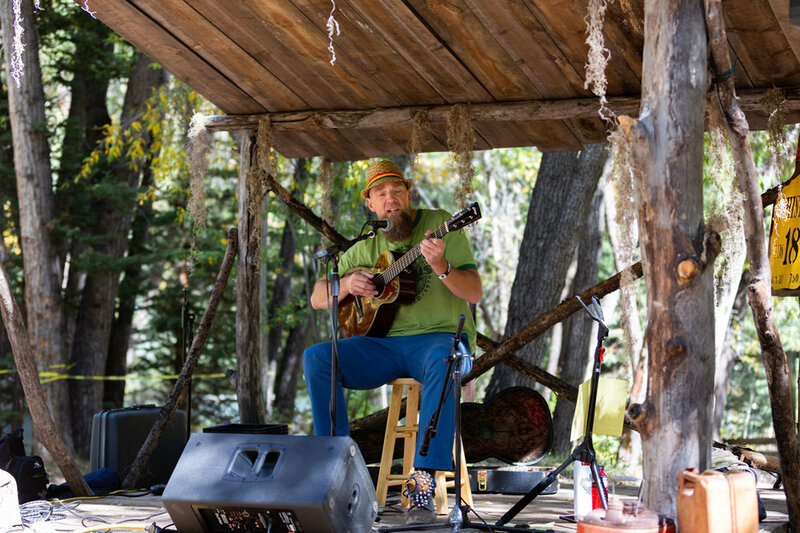 The Festival Campground offers a variety of amazing options to enjoy vehicle camping in the heart of the San Juan Mountains. Limit one per customer - Only 10 Available! The Telluride Town Park Campground has a limited amount of 10 RV Campsites located a quick three minute walk from the festival grounds. RV camping or sleeping in an RV is allowed in these designated campsites only. RV camping is not permitted residential areas in the Town of Telluride or Mountain Village. Any vehicle 18 feet and over in length is considered an RV. The maximum length of RV’s allowed in the Festival Campground is 30 feet. No hookups are available, but restrooms and hot showers are available nearby in the campground. Generators are allowed as long as quiet hours are respected. The RV Pass includes 4 days of RV parking in the Telluride Town Park Campground. All RV campers must have a Camping Pass and a Festival Pass (sold separately). This is a parking pass, this ticket does not include festival or camping passes. Vehicle Camping Passes allow parking for one vehicle next to your campsite located a quick three minute walk from the festival grounds. Designated campsites for vehicles in the festival campground are very limited and sell out almost instantly. Vehicle camping or sleeping in a vehicle is allowed in these designated campsites only. Vehicle camping is not permitted residential areas in the Town of Telluride or Mountain Village. “Vehicles” are considered to be any automobile up to 18 feet in length. Vehicles 18 feet and over in length are considered to be an RV and will need an RV Camping Pass. Restrooms and hot showers are available nearby in the campground. The Vehicle Camping Pass includes 4 days of vehicle parking in the Telluride Town Park Campground. All vehicle campers must have a Camping Pass and a Festival Pass (sold separately). This is a parking pass, this does not include festival or camping passes. Camp in style with one of our Glamping options provided by Colorado Yurt Company. Leave your worries (and camping gear) behind and come stay in one of our Luxury Tents located in a prime camping location exclusive only to Glamping patrons. Each Safari-Style Tent comes equipped with all you need from top to bottom! Just bring your clothes, food, and essentials with you and we will take care of the rest! To purchase a Glamping package, click below. We’ve partnered with Project Shelter once again to enhance your Blues & Brews camping experience! Let us do the work - skip packing all your camping gear and focus on the fun! Stay at a campsite in the Blues & Brews Basecamp Village (located in the Warner Field Campground, where everything (tent included) is already set up, staked down, and ready to rock. The Basecamp Village campsites have a private community area, shade structures, cooking equipment, tables, and even free morning coffee! Basecamp Village will be set up, fully furnished, and awaiting your arrival! 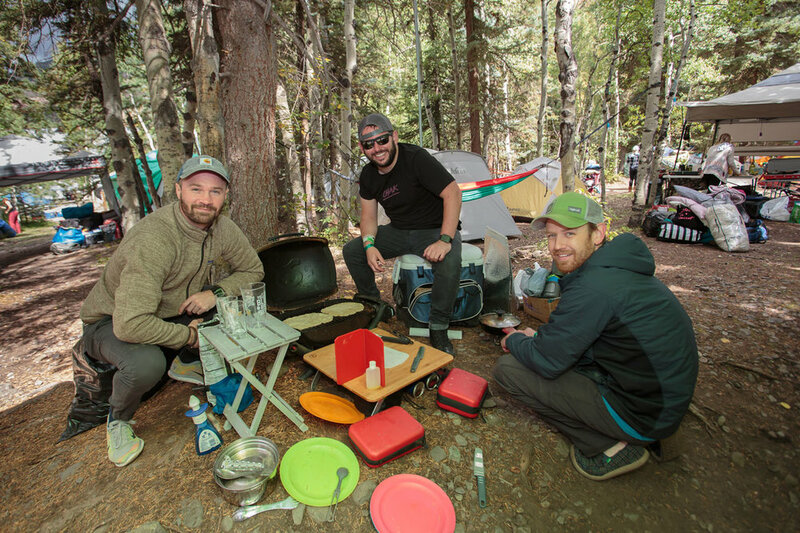 Invite up to 3 friends and save additional money on each Basecamp Gear Rental. Rental Packages do not include Festival or Camping Passes. Camping at Blues & Brews is a righteous experience. To have the best time possible, read the info below to find everything you’ll need to know to have the best time possible. A special perk available to campers only are the shows in the campground exclusive to campers only (camping wristband required for entrance). 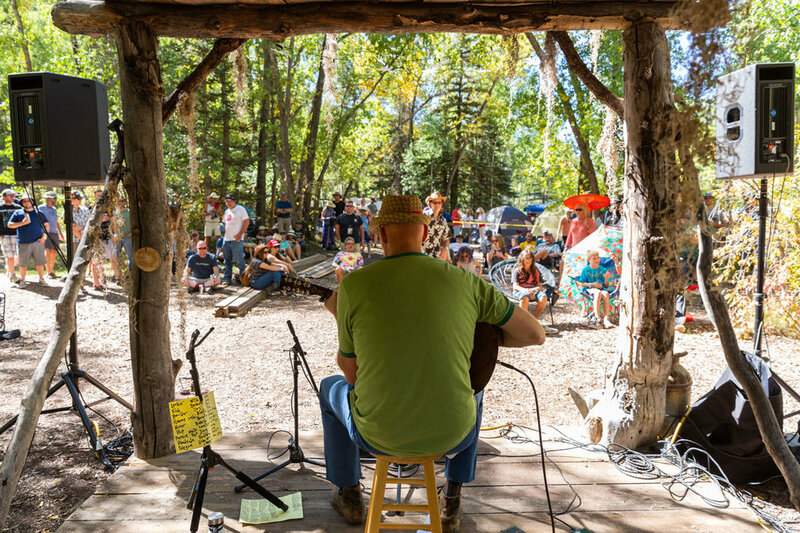 Artists will be playing on the Campground Stage each day of the festival. 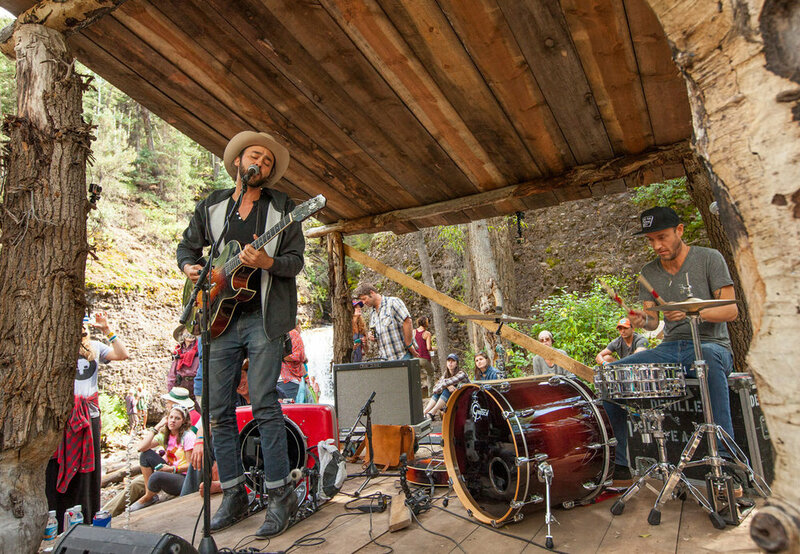 Don't miss the chance to see these performances in an intimate campground setting! Artists and schedule will be announced in spring 2019. 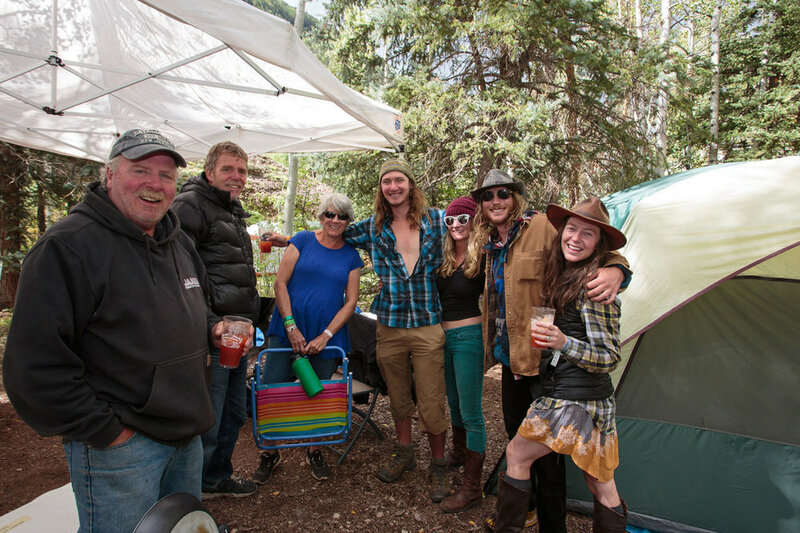 Telluride Blues & Brews Festival is teaming up with the Leave No Trace Center for Outdoor Ethics, an educational non-profit organization to encourage all of you to green the scene by entering the “Making My Blues Green – Coolest & Cleanest Campsite Challenge". Just take a few minutes to swing by the Leave No Trace booth to register and let them know you are being clean and sustainable here at the festival and you are instantly entered to win FREE swag including tickets for next year’s festival! How Do We Participate? . . .
Name your campsite and register it at the Leave No Trace booth located in Sponsor Village. Stop by the Leave No Trace booth each day to view all entries and daily winners. Post your campsite name for judging in the campground and popular vote! Winners will be announced daily with the Grand Prize winner being selected after the campground is loaded out on Monday. How Do We Win? . . .
Cleanliness: Green is clean. Show us how creative you can be in keeping your site clean. Sustainability: Show us how you Reuse, Reduce & Recycle your campsite. Some ideas: Reuse cups, utensils and water bottles; Alternative green energy sources to power your campsite; carpool and bike; share your resources with your neighbors. Theme: Come up with a creative and environmentally friendly theme. Make your campsite FUN! Remember, BE ORIGINAL, BE GREEN and have fun!! Popular Vote: Get your friends to come by the Leave no Trace booth and vote for your campsite. They can win prizes too! Don’t forget to post the name of your campsite in the campground visually. What Do We Win? . . .
One grand prize winner will be selected from the daily finalists after the campground load-out on Monday, September 16th. The grand prize winner will receive a pair of Festival and camping passes for the 2019 Festival. Grand Prize – Two 3-Day festival passes plus camping to the 2019 Telluride Blues & Brews Festival. The Grand Prize is awarded to whoever excelled in all three criteria and popular vote! 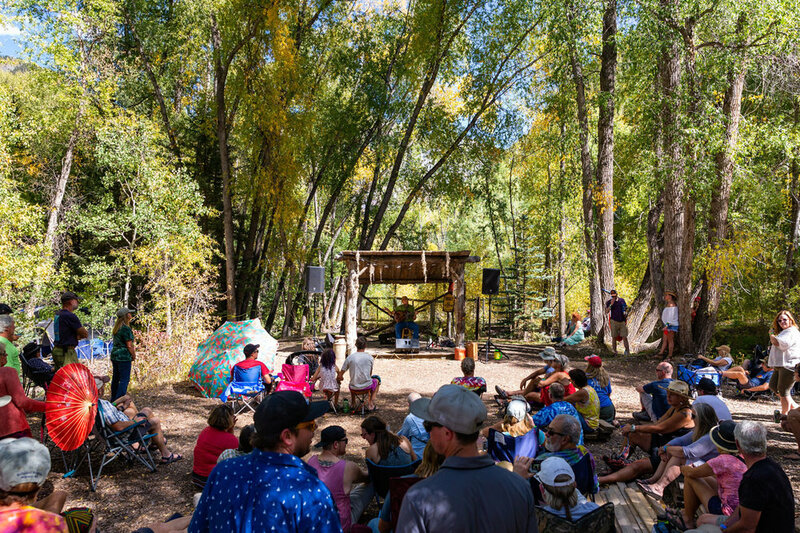 Daily Prizes – Campground passes for the 2019 Telluride Blues & Brews Festival, packs, t-shirts, water bottles and more! Stop by the Leave No Trace Booth to win even more swag. Daily Winners will be announced from the stage each day. Campsites are first-come, first-serve. You cannot reserve a specific site. Please note that festival camping is more of a social experience than a wilderness experience. Expect camping to be clustered close together. A campground host is on duty to help you find an available campsite and to answer any camping questions. Please respect your neighbor. Camping passes are sold per person and per vehicle - not per site. You must purchase a vehicle or RV pass to park your vehicle in the campground. If you do not purchase a vehicle or RV pass you will be allowed a short grace period (30 minutes) to drive in and drop off your camping gear in the campground. You will then be guided by our staff to park your vehicle or RV to the best available parking area off-site. Camping passes are valid for four nights, Thursday through Sunday of the festival. The campground opens to campground pass holders at 8 am on Thursday. Campground pass holders must load out by 11:00 am on Monday. You may camp in the campground before Thursday, but will need pay the town's campground fee. The campground is open 24 hours a day. You may arrive and set up camp 24 hours a day. If you plan to arrive after-hours during the festival weekend, please check in with the campground host for assistance in locating an available campsite. Single day camping passes are not available. You can choose to camp only one day; however, the cost is still the price of four days. Children 11 and under are free. Children must be accompanied by adult supervision. Only Festival pass-holders may purchase Camping Passes. In other words, you cannot camp in the campground unless you are attending the festival. You must have both a camping pass and festival pass to enter the campground during the festival. Restroom and shower facilities are available in the campground (flushing toilets and all). There is a $3 charge to run a hot shower for 5 minutes and $1 for additional time. The showers are operated by quarters-only so bring plenty of quarters. Can I bring my Dog? . . . Unfortunately dogs are not permitted in the campground. Can I camp near my friends? . . . Camping is first come first serve. If you would like to camp next to friends you will have to arrange this as best as possible with the area available. My friends are in Glamping. Can I still visit them with a GA pass? . . .
GA camping passes are not valid in the Glamping Village. Will there be a host or security? . . . There is a host located in the main campground all weekend. There will be security provided 24 hours a day from Thursday-Monday in all campgrounds. Campground security and host will strictly enforce all rules including quiet hours. Can I keep my valuables in the campground? . . .
We will not be responsible for any lost or stolen items. If you leave anything at your campsite it is at your own risk. Will I be able to charge my phone? . . .
For general campers there will be outlets and charging stations provided. Charging stations may be found by the bathrooms. Glampers will have power in their tents. Can I bring alcohol into the campground? . . .
You are allowed to bring your own alcohol/food/beverages into your campsite. You are not allowed to walk into town with any open containers. You will not be allowed to bring any alcohol in to festival grounds either. Can I have a grill or small stoves for cooking? . . .
You are allowed to grill on grills that are already in the campground, personal charcoal grills and propane grills in Town Park campground. If you are camping in Warner field you are not allowed to use charcoal grills, propane grills are permitted. Can I give my camping pass to a friend? . . .
Once you have exchanged your ticket for a camping wristband it is non-transferable. Mutilated or torn wristbands will not be honored. Can I bring friends into the campground? . . .
No you are not allowed to bring non-campers into the campground for security reasons. Is smoking allowed? . . . Smoking is permitted but we ask all of our campers to please be respectful of their neighbors. Marijuana may not be consumed openly or publicly. The best course of action is to be respectful to those around you at all times. Security will intervene if there are complaints. Are there Showers/Bathrooms? ADA accessible? . . . Yes there are showers and bathrooms available and they are ADA accessible. What hours can you use showers? Are they free? Where are they located? . . . Cold showers are free but hot showers have a charge of $4.00 for 3 minutes. This must be done in quarters. The Campground Host will also have quarters for you if you forget. One set of showers is located by the swimming pool and the others are located on the east side of the campground. They will be available 24/7. 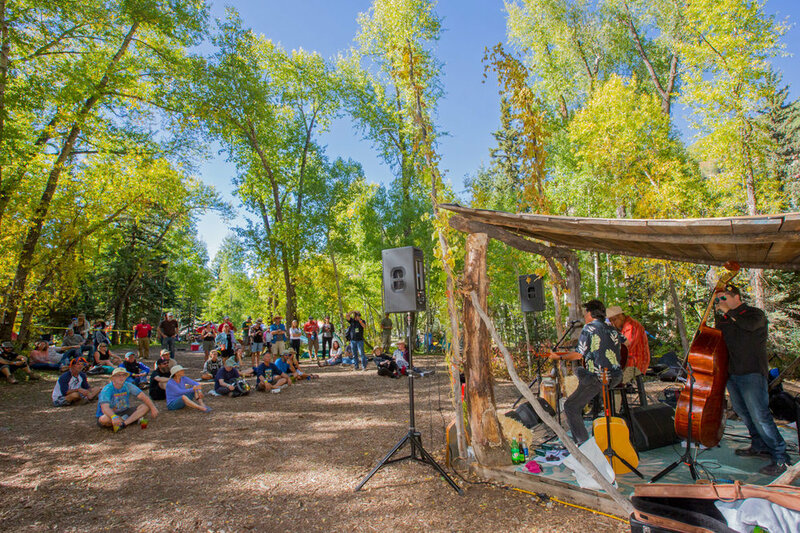 What are the Campground Sessions? . . .
A special perk available to campers only are the additional shows in the campground exclusive to campers only (camping wristband required for entrance). 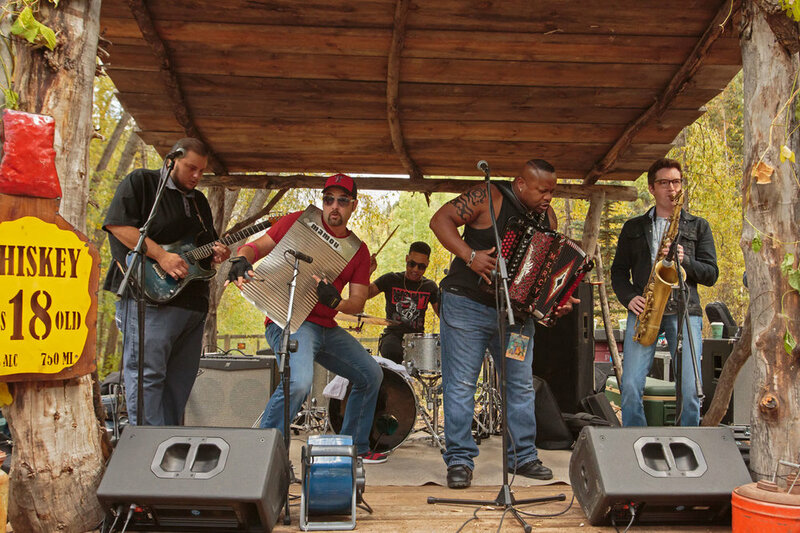 Artists will be playing on the Campground Stage each day of the festival. 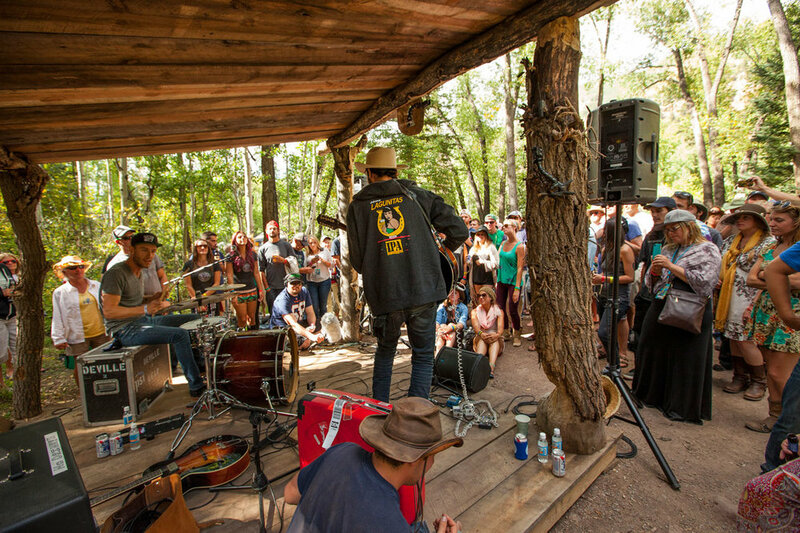 Don't miss the chance to see these performances in an intimate campground setting! Click here for more info. How do I check into the campground? . . . Please drive directly to the campground and festival volunteers will direct you to unload your vehicle and where to park your vehicle. From there you will be able to got to the Box Office and exchange your tickets for wristbands. You do not need your credentials to unload your equipment. You have 30 minutes to unload your vehicle unless you have purchased a campground vehicle pass. Are campsites designated? . . .
No, all camping is first-come/first-serve with no designated sites being enforced. There are no campsites in the campground and it is communal camping. So get to know your neighbors. Will there be a lost and found? . . .
Lost and found is at the warming hut next to the Town Park Oval on the path from the Box Office to the main entrance of the festival. Will there be electrical outlets? . . . Yes there are outlets but they are very limited and only at bathroom locations. Can I bring a bicycle? Are there local places to rent a bicycle? . . .
You are allowed to bring a bicycle. However, there are no designated places to lock your bike within the campground. You can rent a bike from one of the many bike stores in Telluride. Please note that no bikes will be allowed in the festival grounds, you must leave your bike at the designated bike parking area at the Box Office or locked at your campsite. How close are the campsites to the festival site? . . . Depending on your campsite all camping is within a 2-3 minute walk to the festival site. Where do I park? . . . If you have purchased a campground parking pass you will be able to park in the campground with a pass displayed in your windshield. If you have not purchased a campground parking pass campground volunteers will direct you to free parking for campers elsewhere. Will there be ice available for purchase? . . . Yes, ice can be purchased through the campground host. How long can I be in the campsite? . . .
A majority of camping is located within the Town of Telluride campground. If you arrive prior to Thursday you have to camp in a town designated campsite and pay Town of Telluride fees. After 8:00 a.m. Thursday the Festival takes over the campground and all camping becomes first come first serve - no designated sites. 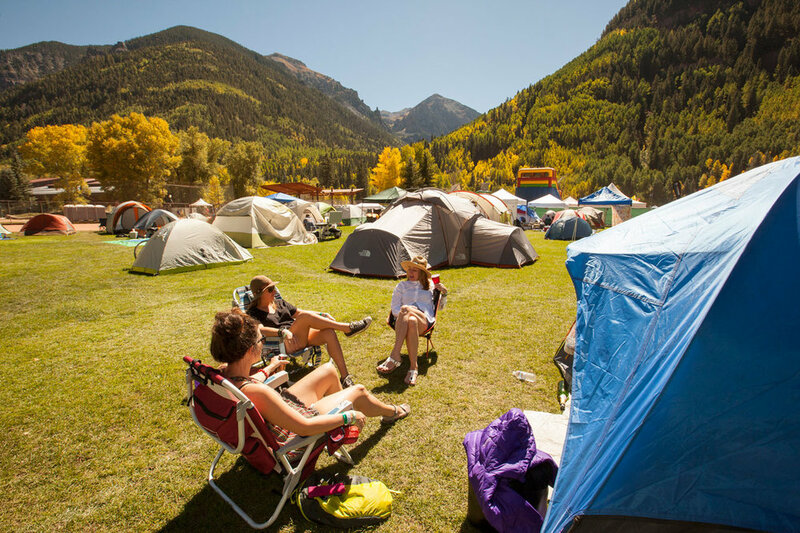 If you arrive Thursday morning, you are allowed to line-up early but will not be allowed to enter until 8:00 a.m. All Festival campers must be out of the campground by Monday at 11:00 a.m. at which time control of the campground returns to the Town of Telluride. Camping areas (walk-in/tent only) are only available starting Thursday morning at 8:00 a.m.
Can I camp in the campground without a Festival ticket? . . .
No campers will be allowed in the campground that do not hold tickets for the Festival. Regional Camping . . . There are plenty of options to camp outside of the Town of Telluride. The two closest campgrounds that we recommend are the Sunshine Campground and the Matterhorn Campground. Both are conveniently located within a short driving distance and are easily accessible without a 4-wheel drive vehicle. Sunshine Campground is a single loop, paved campground with 15 campsites nestled in a dense aspen forest featuring a small mountain lake. A spectacular view of Sunshine Peak is visible from many sites. Hiking trails, fishing and jeep roads are found nearby. Lizard Head Wilderness is a short drive away. Unfortunately, reservations cannot be made in advance, all sites are first-come, first-serve. For more information, click here. Matterhorn Campground is a highly developed campground adjacent to Colorado State Highway 145 near Telluride, CO. There are 28 campsites with 4 of them offering RV hookups (electricity and septic). Most sites have pleasant views, especially the walk-in tent sites with unobstructed and panoramic views of the mountains. Showers are available to both overnight and day use guests. All sites have picnic tables, combination fire-rings and grills, and lantern poles. Firewood is available for a fee. Reservations can be made in advance but certain sites are first-come, first-serve. For more information, click here. My question isn't here! How can I get the answers I need? . . . Please feel free to contact us with any additional questions here. If it gets asked frequently we'll add it to the page.